What I enjoyed most about working at Phillips Solicitors was how I was not treated like I was a student on a placement but as an employee of the organisation. 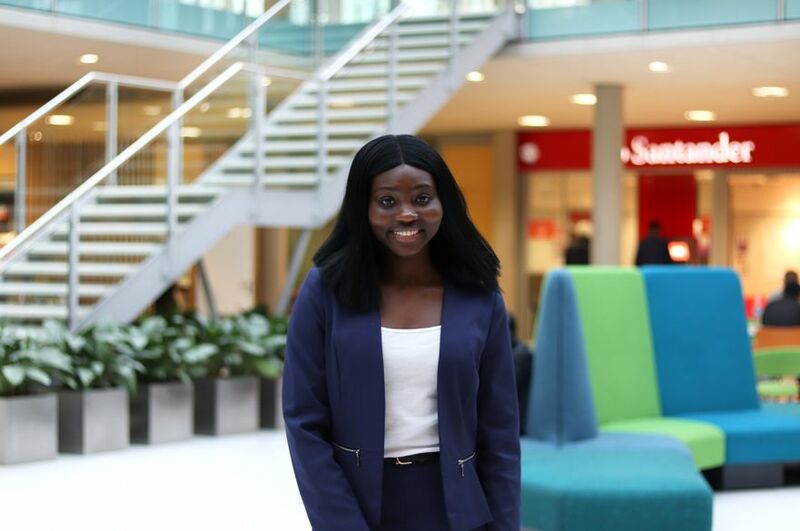 Cindy shares her experience of her work placement at Phillips Solicitors which she undertook whilst studying Law (Full-time) LLB (Hons), her reasons for choosing to do a work placement, her future plans and what she has enjoyed most about life at NTU. One of the biggest draws to taking up a work placement with Phillips Solicitors was that they were a small high street law firm that offer a wide range of services that I was interested in. I felt that I could see myself fitting into a firm like that. Moreover, I thought that I would be able to get stuck into work there quickly and I enjoyed it a lot! I found that both the NLS Law Fair and NLS Employability team were really helpful, particularly the NLS Employability staff, as they really helped me through each step of securing my placement. They advised me on how to edit my CV and Cover Letter to fit the criteria of the job role at Phillips Solicitors and also coached me on how to prepare for both telephone and face-to-face interviews. The application and interview process was quite straightforward, thanks to the help from the NLS Employability service team. The interviewers at Philips were very approachable and they were not just solely interested in my qualifications and previous legal experiences, they took the time to get to know me as a person and I found that was a really refreshing approach. During my placement I was doing a lot of paralegal duties in the different legal departments at Phillips Solicitors. I was put in charge of opening new client files, drafting letters and emails to clients, taking telephone calls from clients and third parties, filing and billing of files, conducting legal research, sitting in client interviews, creating attendance notes, transcribing police interviews of clients and accompanying solicitors to the Magistrate and Crown Courts to name just a few highlights of my role during my work placement. The work placement was really useful in helping me to understand how the theories that I had learned in my modules during study are very different to when they are put into practice. I’m currently in my final year studying a module called Path to Professional Practice (PPP) and I believe that my work experience skills have really helped me to understand this module better. What I enjoyed the most about working at Phillips Solicitors was how I was not treated like I was a student on a placement but as an employee of the organisation. I felt like I was included in a lot and that my opinions and efforts were greatly respected by the business. I also enjoyed that I was essentially learning on the go and really stemmed my interest in conveyancing. I felt that the placement was really useful in allowing me to develop key transferable skills that I can now take with me to any organisation that I join once I graduate. For example, I quickly realised that time management was very important, having had to balance and learn how to prioritise activities. I have also developed my communication skills further and I now understand how to be professional and confident when speaking on the phone. Furthermore, I realise how important legal research and how critical it is that legal research is conducted properly in order to help a solicitor in the long run. If I could give any advice to students applying for a work placement, I think you should really keep an open mind and don’t limit yourself. If you don’t have an ounce of legal work experience or general work experience try to focus on the skills that you have developed or gained with each of the modules that you have studied, or that you have picked up as part of any societies or sports activities that you take part in. Additionally, make sure you do use the facilities provided for students here at NTU because they really are here for our benefit. Throughout my time at NTU I’ve met some amazing people who have positively impacted my life. Nottingham itself is great in that most things that I need are within walking distance from me and the convenience of the tram stop being on my doorstep is an added bonus for any longer journeys I need to make. I enjoy the city so much that I want to build my career here. I love how the law course is taught here at NTU. The lecturers and tutors are very helpful and really do their best to make sure that you fully understand the modules. They also have days and times that you can schedule meetings in to have 1-1 support from them. The facilities, such as Boots library, are great and the fact that it’s accessible 24 hours during term time and that the librarians are available at all times to help you with any queries is even better. The Student Union is such a great addition as well and they really put a lot of effort into making sure that student life here at NTU is a joy! After graduating next year, I plan to do some travelling and then work as a legal assistant for a law firm in Nottingham and gain a training contract with them. Following this I would like to come back to NTU to do my LPC.